The grip of winter has a way of slowing things to a crawl. Common fishing tasks such as waking up early in the morning, rigging a rod, or wading across a river take time. The bitter cold has a way of doing that to you, and the fish. We awoke around 10 a.m. in New York, and soon stepped outside to a thermometer reading a balmy eight degrees. 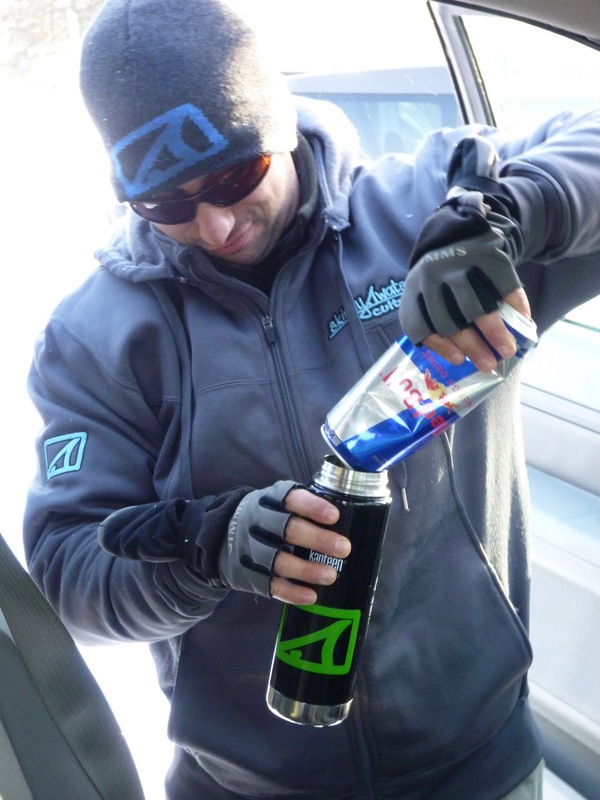 Outside the truck, I squeezed Red Bull slushy into an insulated bottle for the day. The temperature would later climb into the high teens in the afternoon, but that didn't really matter. It was cold, and along with it came a host of fishing related cold problems. Due to my inability and lack of determination to grow a beard, I had a hard time talking because I couldn't feel my face. Other problems occurred during my first fish of the trip. The small buck couldn't take out any line and I couldn't reel any in. It thrashed in the current, while I was bending down defrosting a reel and line with my breath. I defrosted in enough time to prevent the fish from breaking 4x and I recovered the only ground I needed to land the fish as my rig refroze. A word of warning, do not use Sharkskin fly line under any circumstance in freezing weather. Thankfully, the cold made the fish lethargic enough to not break me off. Aside from a few select holes everyone was fishing, the fish were hard to find in the higher flows of 1700-1800 cfs. Not one to join the bottom bouncing majority, we only caught a few. It seemed as though we had to drift the flies into the fish's mouths to get a take, as they were soft and few. Our best luck came in side channels where we could easily find holding lies. Our unfamiliarity with the river in high water made this our best bet, so we tried to take advantage of it. If you can brave the low temperatures, fishing in the winter time can provide many advantages. For one, there are lighter crowds that can yield moments of solitude amongst snow covered pines. This environment provides quite the scene to enjoy catching a lake-run fish. Even if things are slow, all you have to do is take a look around and imagine a day at work. That should put things into perspective as your hopping on the bank trying to restore feeling in your toes. That's a very respectable beard. Nice photos, too, especially that first one of the river with the boat in the background. Is that the Altmar bridge? Dub- yea it is, was able to find a spot to fish there for about an hour on our last day, caught 5 along the big seam there. Beer- It sure was. Sometimes you just have to do whats more productive, Haha.